Then a little bag of treats arrived on my doorstep. It seems I had a secret globe-trotting Easter bunny with a taste for all things good. 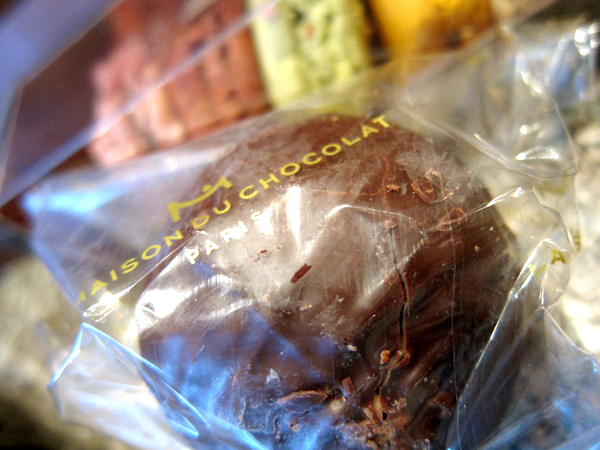 Inside the bag, there was a box of macarons, a bag of chocolate Easter eggs and a giant chocolate praline all from La Maison du Chocolat. I know what you’re thinking, it’s a chain. But these ones came from a location in France! Just that alone made them all the more special. And if you’re wondering about the taste, let me tell you, they didn’t disappoint! I’ll start with the chocolate praline which was amazing! It was about the size of a Jawbreaker. I think it was about 2″ in diameter. The best way to describe it is to compare it to a Ferrero Rocher without the wafer. It’s a ball of chocolate ganache that’s been rolled in a nut mixture and then given another coating of a dark chocolate. I needed a knife to cut this one into bite sized pieces. And I’m not embarrassed to say that I ate it all in one sitting. It was that good! I only wished I had remembered to take a picture of it cut in half so you could see the inside. Next were the milk chocolate Easter eggs. I didn’t want to eat them all after indulging in the chocolate ball. So I only ate one because I want to enjoy these over the week! Slightly bigger than the wrapped chocolate Easter eggs from Lindt, these were also filled with the same tasting ganache as the chocolate praline above. These were also really yummy without being overly sweet. I think that’s the difference between North American and European chocolate. This chocolate actually tasted like chocolate whereas North American chocolate is just sweet and sugary. But I digress. And then there were macarons which I love if only because they’re such a dainty treat. If you’ve ever had a macaron, you’ll know that they’re the tiniest of things but these ones were oh so good! They were filled with a ganache that was nice and creamy and not too sweet. And they still had a slight crunch despite being transported for nearly half a day around the world. How do they compare to macarons made locally? 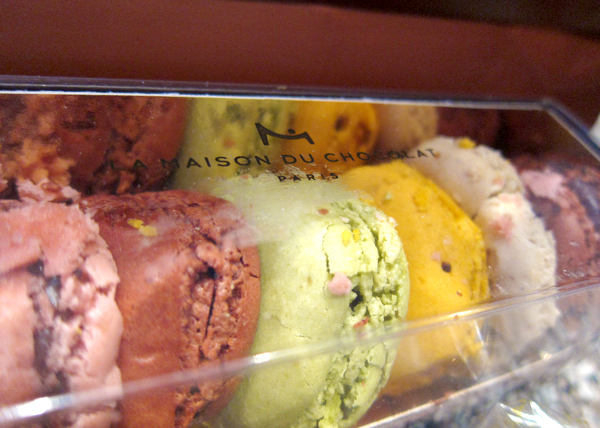 I’m not quite sure because I haven’t had a macaron in a long time. Hmm… Maybe I’ll have to do a little tasting to find out! Finally, there was a Ritter Sport bar. This was a flavor that I had never seen before. I’m guessing yogurt, honey and hazelnut from the picture. I haven’t had a chance to open it but it definitely looks like an interesting combination of flavors. So even though I didn’t get the usual assortment of Cadbury Creme Eggs, Mini Eggs, jellybeans and other goodies, I can’t say that I missed out. These were definitely an unusual Easter treat that I’m certainly enjoying. 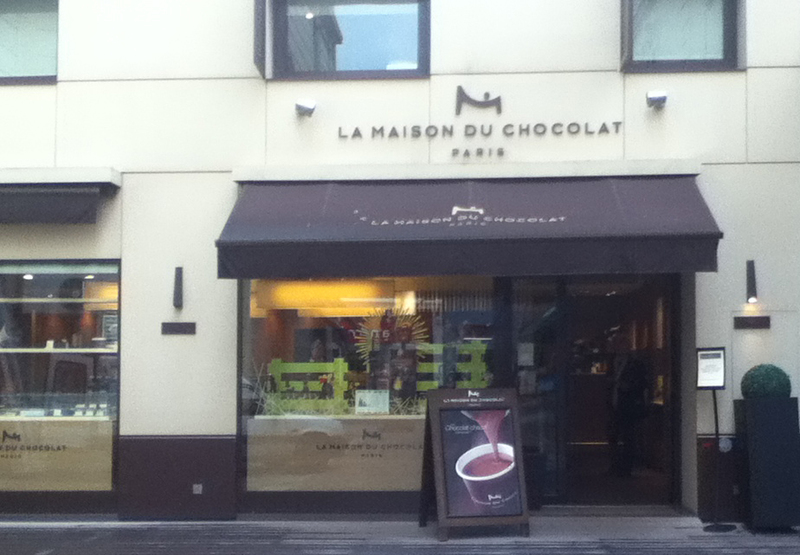 Good thing La Maison du Chocolat ships! 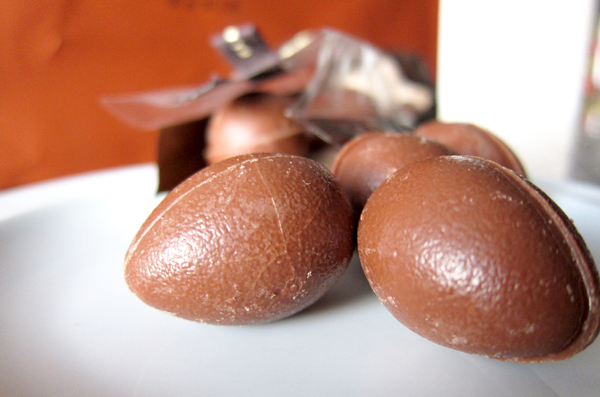 I’m a BIG fan of La Maison du Chocolat – you have the best Easter bunny!